Councilman Jeffree Fauntleroy, left, talks with Atlantic City Mayor Frank Gilliam, right, as they appear at North Wildwood Municipal Court in North Wildwood, N.J. The assault complaints against Gilliam and Fauntleroy were dismissed. Fauntleroy will pay a $500 fine on obstruction of traffic ordinance violation, stemming from a melee outside an Atlantic City casino. NORTH WILDWOOD — Atlantic City Mayor Frank Gilliam walked away from a municipal courtroom 40 miles from his hometown with all assault and harassment complaints against him stemming from a Nov. 11 fight outside a casino dismissed. 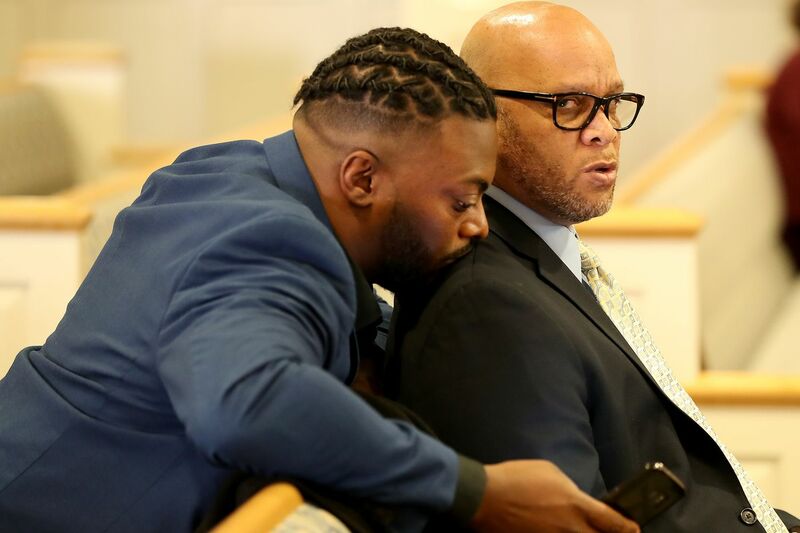 His co-defendant, City Councilman Jeffree Fauntleroy, whose punches caught on a security video landed their mark, unlike the ones seen thrown by the mayor, agreed to pay a $500 fine imposed by Municipal Court Judge Louis Belasco on one violation of a city ordinance against obstructing traffic. Gilliam’s legal problems are far from over. As Fauntleroy’s attorney alluded to after the hearing, Gilliam remains under investigation by the FBI and IRS, whose agents raided his home in December. Joseph Camarota, left, Gregory Aulicino, second from left, Councilman Jeffree Fauntleroy, center, and Atlantic City Mayor Frank Gilliam, right, appear at North Wildwood Municipal Court in North Wildwood, N.J. The assault complaints against Gilliam and Fauntleroy were dismissed. The video showed a fight outside the Golden Nugget casino involving Gilliam, Fauntleroy, and three employees of the Haven nightclub, including Greg Aulicino and Joseph Camarota, who filed the original complaints against the two elected officials. In court, Fauntleroy acknowledged only that his actions impeded the flow of traffic in a public place, in this case the valet area outside the Golden Nugget, where the 2:30 a.m. scrum took place. “He’s acknowledged he obstructed the flow of traffic on Nov. 11, 2018,” said attorney Leonard. "That’s exactly what the video showed him doing. " Fauntleroy said he was “absolutely” satisfied with the outcome. "It’s a great day for me, a great day for Atlantic City. I get to move forward." The hearing was the second time for Gilliam and third for Fauntleroy traveling from Atlantic City to the quiet off-season courtroom in North Wildwood, where the cases were transferred to avoid a conflict of interest in Atlantic City. The two entered not-guilty pleas in December to the complaints, in which the three employees of the Haven accused the officials of simple assault and harassment. When agents raided Gilliam’s home, they carted away boxes and computer equipment. Former political allies of Gilliam have said they have been questioned in connection with possible campaign finance violations. A nonprofit Gilliam founded, Connecting the Dots, which was the announced recipient of money raised at Gilliam’s inauguration gala, has also been scrutinized. The FBI has made no public statements about the investigation into Gilliam since the day of the raid. The Cape May County Prosecutor’s Office declined to file criminal charges against the officials, but the complaints proceeded in Municipal Court, where they would have been punishable by up to 180 days in jail. According to the citizens’ complaints, Aulicino accused Gilliam of attempting to punch him. “Aulicino stated that Gilliam swung a punch but missed but kept trying to attack him,” the complaint stated. A second complaint, by Camarota, also said Gilliam swung and missed, and chased him around a car. Rodriguez filed a similar complaint against Fauntleroy. Aulicino’s complaint against Fauntleroy stated that he punched him several times and threw him to the ground. Copies of simple assault complaints filed against Atlantic City Mayor Frank Gilliam stemming from a fight outside the Golden Nugget casino in November 2018.